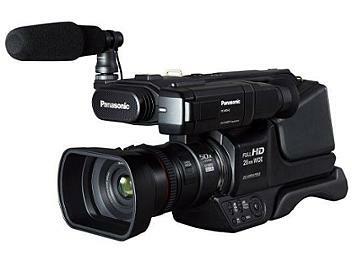 The Panasonic AG-AS9000 AVCHD Camcorder is a shoulder-mount HD camera with a pro-style form factor that gives you added comfort and stability during long handheld shoots. The AG-AS9000 offers the stability of shoulder-mount shooting, packed into a high-mobility compact package. Comes complete with large grip and zoom lever, plus a wide-diameter focus ring for smooth, positive operation. Connecting the external microphone lets you record high-quality sound while you shoot. REC start/stop button and zoom lever are mounted on the top of the hand grip. This is particularly helpful for smooth operation when shooting from low angles. The large, easy-to-hold focus ring gives you quick, precise focus control. It lets you take both subtle, delicate shots and bold, expressive ones. By contacting the camera at three points--the large eyecup, the grip belt, and the shoulder pad--you gain outstanding stability compared to a conventional "handy type" camera. The viewfinder tilts up and down--a real convenience when making high-angle and low-angle shots. For long events, this battery lasts up to 5 hours and lets you concentrate on shooting--without worrying about battery reserves. In proportion to the zoom setting of the lens, the two ECMs (electret condenser microphones) adjust automatically to bring sound and images together for exceptional atmosphere. The AG-AS9000 lets you shoot with Full-HD picture quality. You can capture the fine details of important events in high-definition and then enjoy the beautiful results on a large HDTV screen. Standard image quality can also be recorded by the camera. Therefore, you can choose the optimum format for different playback and editing situations. And since this standard image format is resized from Full-HD, picture quality is more attractive and detailed than in conventional DV recordings. Intelligent Zoom, which was achieved due to the Intelligent Resolution technology of the AG-AS9000's image processing LSI "Crystal Engine PRO," enables telephoto shots at up to 23x magnification. Even when the optical zoom range is exceeded, telephoto shots maintain their clear, beautiful HD image quality. Control settings are made by simply touching the LCD screen. Operation is intuitive and easy, and the large letters are easy to read. Shooting and viewing are simple and stress-free--even for beginners. The 35.8mm wide-angle setting on the AG-AS9000 fits more people and more of the background into the frame than a conventional 42mm lens. This is especially handy when you want to take a group photo in a small room. For even wider angle 25mm results, add the optional VW-4607H Wide Conversion Lens. This powerful function senses the shooting conditions and automatically makes the settings and activates functions that will deliver optimal results. This hybrid system combines the advantages of optical stabilization and electronic stabilization in one. It helps capture beautiful images under all conditions by detecting and compensating for instability caused by a variety of movements. In addition to optical stabilization, it provides more powerful electronic correction during high-power zooming. This function automatically detects and suppresses only wind noise, to give you natural sounds with lifelike ambience. The AG-AS9000 records on SDXC/SDHC/SD Memory Cards and 32GB build-in memory to provide outstanding compatibility with PC applications and rapid data transfer. Compared to the DVC format, this media's image data can be transferred to a computer in about half the time to get jobs done more efficiently. Let your true creativity shine, with a wealth of manual controls at your fingertips. Of course, you can also switch to auto mode, ideal when you need to start shooting at a moment's notice. This camera is very comportable for solder, good in a low light ,Direct SDI, HDMI, AV OUT put are available so while we give more quality in live, good result while day or indoor lighting. i bought this camera Feb 2015, and i recommend my bro 5 of them bought this camera. Development of the MDH1/MDH2 series, now with HD-SDI output.